Each May, pedestrians around the world gather to walk in honor of Jane Jacobs, the legendary urbanist and writer whose book The Death and Life of Great American Cities waged significant influence on twentieth-century urban planning. The commingling of Jane Jacobs’ belovedness, the city’s rapid development, and the Detroit Design Festival furnished the opportunity for a second Jane Jacobs-inspired walk this year. Put on by the Detroit Creative Corridor Center, the tour met last Saturday afternoon at the Model D headquarters at Second and Prentis. Twenty-five or so people were out on the sidewalk, enjoying summer weather that was by no means the crisp day forecasted by the handout we received. Without much introduction, we set off to check out the “pedestrian overpass crossing America’s first freeway,” which would be a long walk, since it is actually in California. From Forest, we looked out over the Lodge at the cars and the Canfield and Selden bridges. Jane Jacobs spent much of her career fighting the imposition of highways, making this site an interesting choice. We looped over the Canfield bridge back into Midtown, our guide Ellie breezing through the stops, pausing long enough for everyone to quietly absorb and reflect before moving on. Whether foot or car people, the tour had initially left behind about two-thirds of them, who we found standing in the Green Alley. The tour redivided, and our guide Ellie, who had designed the tour, went with the other group. Even with the new guides, it was truly a Jane Jacobs-inspired event — a little messy; a chatty, neighborly, organic, do-it-yourself affair that very successfully brought together all manner of smart, curious people. There was minimal standing around straining to hear the guide’s authoritative perspective as happens on so many other tours. Participants were left to consider and surmise for themselves, to see what their own “eyes on the street” could tell them. This democratic approach had its downsides. At some point we picked up a very vocal and relentlessly pro-development yahoo, a pal of the founders of the Green Garage. We stood on Second looking through the red frame at the Green Garage across the street while this loudmouth dickwad ranting colorfully about the “abominable shithole” of the laundromat behind us. It’s not the most gorgeous dumpy single-story building in town, but the “strip mall” parking lot in front he was so vehemently decrying is useful to people unloading heavy linens. Safe to assume he is not coming “down to Detroit,” as he put it, to do his laundry. This guy even wrangled the role of guide at one point, suggesting that we detour to check out the El Moore renovations, also courtesy of the Green Garagers. The tour, which was supposed to be two miles and last an hour, had been steadily losing participants, and quite a few more vanished as we followed his lead. On Cass just north of Alexandrine, we stared intently at the shiny exterior of La Feria and Thrift on the Avenue as our guide, excitedly filling us in on last year’s commercial development news, told us that “before then, nobody walked south of Willis.” A woman and her young daughter scurried past us, southbound and muttering apologies, ducking to keep out of the way of our cameras. Incredulous, I asked, “How did people get to the Old Miami?” “I mean, like, regular people didn’t walk past there,” he clarified. So who is it that goes to the Old Miami, irregular people? Ultimately, the circuitous route we followed gave the impression that the whole city may be made of Cass-and-Canfields, or should be. While it’s undoubtedly nice to have places to go and things to see other than abandoned buildings, this walk offered as much trite development cheerleading as one might expect. “I saw who was putting it on — I wouldn’t go,” a friend told me afterward, referring to its starting point at Model D. At least half of the ten stops related directly to the Green Garage, Model D, or Midtown, Inc. Did the out-of-town visitors get to experience Midtown beyond this narrow scope? 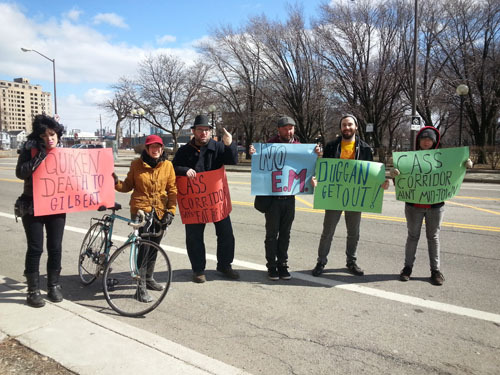 And what of the Cass Corridor? As the walk’s handout read, “For as much activity as there is happening today, the neighborhood is perhaps even more interesting for the history that exists there.” The walk’s celebration of history was a quiet party attended by few. It’s unfortunate that Tom Boy Market’s closure and future reuse as high-end retail came a week too late. It would have been an fine additional example of gentrification in progress. As Jane Jacobs said, “Cities have the capability of providing something for everybody, only because, and only when, they are created by everybody,” especially luxury loft-dwellers and rooftop-cabin hostel-goers who visit Detroit in search of more high-end retail shopping opportunities. I was unable to stay for the post-walk chat at Great Lakes, but I hope the expensive pourovers fueled a more nuanced conversation. Until recently, Detroit had a reputation for being a sort of urban ‘wild west.’ There was a certain pervasive lawlessness — the ignored traffic signals; the flourishing of large colorful Heidelberg dots on collapsing homes; the knowledge that if called, no police would arrive for days. There was a small undercurrent and large stereotype of anarchy and sometimes violence, of fierce frontier people eking out the best living they could. There were vast stretches of prairie, beekeepers, urban farms, and hardly any security cameras downtown. You could go to Belle Isle anytime you pleased. So could everybody else. There was a feeling that anything could or was happening here, very distinct from the kinds of anythings about which Dan Gilbert dreams. With its wild midwest atmosphere, it’s about time Detroit has a proper ranch, but I was still surprised to see animals out grazing on grasses and chicory in the Cass Corridor. Actually, they weren’t quite animals roaming the lawn but the anthropomorphic forms of radiators, letting off steam on a cool afternoon. The radiators have a bright petting-zoo color scheme and a silky finish. They seem friendly and well-adjusted — the small red one I approached didn’t bite. They’re much quieter than most radiators I’ve met, none of the usual hissing and clanking. In what is clearly their natural environment, they’re happily thriving. Most radiators have free range on their patch of grass, with no fencing to keep them off the sidewalk. One young orange radiator, lanky and skinny-ribbed, is isolated in the security of a chicken tractor. A stenciled sign is accompanied by a charming note from the rancher instructing passersby not to feed the radiators. A ranch is pretty self-explanatory — there are animals; they are tended — but, being a city person unfamiliar with ranch operations, I had some questions. What do radiators do in the winter? Do they try to migrate? Do they stay outside in a shelter or coop like chickens do, maybe with a heat lamp? Should I bring them a dish of water, or does dew suffice? What are their names? The rancher was unavailable for questions. On another fortuitous occasion, it was possible to meet the rancher, who turned out to be Aaron Timlin, of Detroit Contemporary fame. Installation of the new ranch was done with the help of a young niece, Timlin said, figuring that painting was a good project to share. The radiators have been out for a few days, but, occupied with other matters, he hasn’t been able to keep a close eye on them. He seemed relieved that neighbors were looking after them. Timlin says ideally by winter the radiators will be nice and plump, able to endure harsher conditions. It will probably be mating season for a while, he laughed, looking at two heat exchangers that have been shamelessly going at it next to the sidewalk since they were let loose earlier this week. I hope the gestation period of radiators — one thing Wikipedia doesn’t know — is short enough that a healthy crop of radiator offspring will grow big enough by fall. As a fellow rambler and I stood admiringly on the sidewalk, talking with a friend we’d run into down the street and convinced to come check out the ranch, a neighbor walking by stopped to talk. “They’re cute as hell!” He had his eye on a certain blue radiator, evidently inspired by Timlin’s example and interested in becoming a rancher himself. “Do you know how long they’re going to be out here?” he asked us. “I want to take a picture, but my phone’s broken!” This neighbor had barely left when another visited. “If I stay inside, it’s boring — so I just come out for a walk,” he said apologetically, excusing his lengthy explanation of his own collection of old things, which turned out to be antique dolls. Something exciting is happening on every street — and if it isn’t, good neighbors will make it happen. (Except maybe on mine, where, despite the best neighbors, it took a fatal shooting this week to get everybody together, assembling in something like a really macabre block party). Although Timlin mentioned concerns over potentially negative new-neighbor perceptions of his ranch, this project is just how being neighborly should be done. As more of Detroit becomes the playground, as Chris Ilitch so plainly put it this week, of wealthy “investors,” it is all the more important to defend as much as we can of our playground, our wild west, from the encroachment of bland development’s manifest destiny. Preferably, as Timlin is doing, with creativity and humor. Nothing particularly exciting happened to mark the flip of seasons last week. The equinox came and quietly went with a little fuss of wind. Days are 2 minutes and 53 seconds longer. Today it’s been snowing. People groan and make small talk, wishing the weather would break. 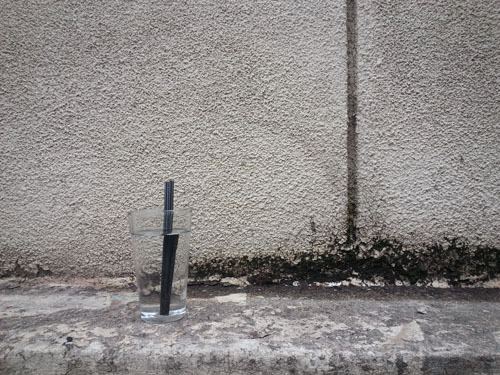 A breath of fresh air, a cool glass of water. It seems that someone has decided it’s time for spring cleaning anyway. For the past two weeks, toothbrushes have been materializing everywhere, in all conditions, minty fresh to old and scrubby. Is there a new dentist in town, handing out freebies? A clean-teeth evangelist making rounds? 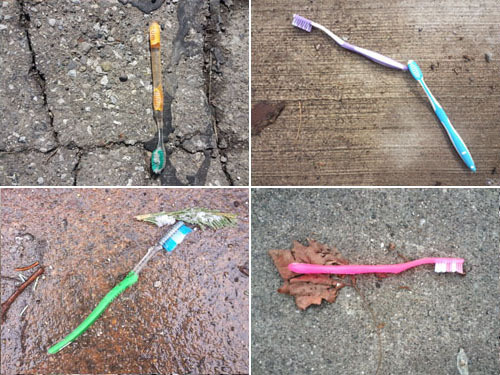 An odd flush of toothbrushes isn’t the only anomaly to puzzle sidewalk users — repeated instances of a particular item will appear in the tight space of a week or two, then vanish. If not all over the city, this is at least the case in the small wedge I most often explore. At the end of February, citrus peels suddenly decorated the snowbanks. Why did pedestrians go so nuts about fruit in that moment? Warm enough for picnics already? Citrus on sale? (Citrus sale happens in January, too). A viral listicle enumerating the health benefits of oranges? What can account for this peculiarity? As mysteriously as they began, the appearances of bright mandarin rinds, half-eaten grapefruits, and smushed clementines ceased abruptly about two weeks later. I can’t wait to see what the world comes up with for April Fool’s next week. 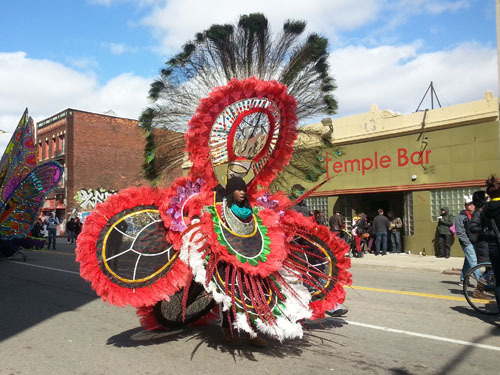 In another type of spring cleaning, Detroiters shooed out the dweeby Nain Rouge again this weekend, hooting and hollering over the 0.9 mile trek through the Cass Corridor to banish the legendary demon. After standing around getting wasted outside Traffic Jam for an hour, the parade slowly threaded south, past new parking lots and imminently shuttering businesses. This obliviousness to history and environment seems to be part of the new tradition of the march. Allegedly a revival of the French colonists’ annual rite to bring peace to their city by chasing the evil red man out, this story is really, as one of the parade organizers admitted to radio producer and journalist Mike Blank in 2011, a complete fabrication. It seems instead to be, if anything historic, an appropriation of Ottawa myth. There was sun but it was chilly, and the march seemed much smaller than past years, though certainly no more shabby. Most people were in costume, except the uniformed cops benevolently corking sidestreets. 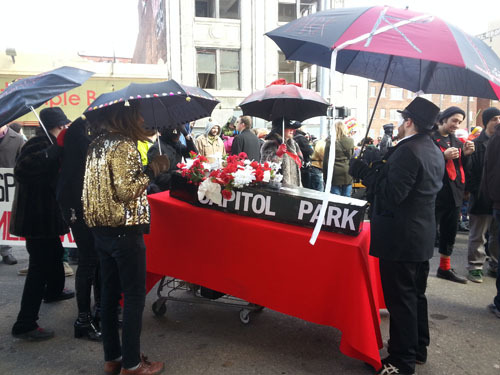 Amid drag queens and hotdogs and people with grotesque masks there was a funeral procession for Capitol Park, some kind of perambulating coffin setup attended by a cluster of people in black clutching umbrellas. The whole effect was comic; despite the spangles, it was slightly reminiscent of goths in high school. Their presence is appreciated, but these are probably not the same kids who would offer to help the evictees move out of their apartments this week in the hideously rebranded Albert building. While there were important messages to be conveyed, few seemed to be in the mood to send or receive them. It was a Sunday, and these people are called ‘revelers’ taking part in a ‘parade’ for a reason. Inebriation and spirits were high, and questioning the debatable history or political correctness of the march was out of the question. One person told me that he cared a lot about our neighborhood but really just wanted to drink tequila with his soccer team. Whatever, I say, as long as it gets people walking. After a dull speech by the Nain, revelers quickly dispersed north toward the starting point or descended into the bowels of the Masonic Temple for the afterparty. Unlike previous years, nobody even touched Cass Park, which isn’t all bad — less spring cleanup. One resident muttered that having people in the park might not be the best idea anyway, given the creaky trees and downed branches. Did I want some firewood?, he asked. Mike Ilitch doesn’t seem to out there making good on the pledge to make or keep the park a functional greenspace. With the ominous shifting of land and narrative, the march just wasn’t as fun this time as previous years. 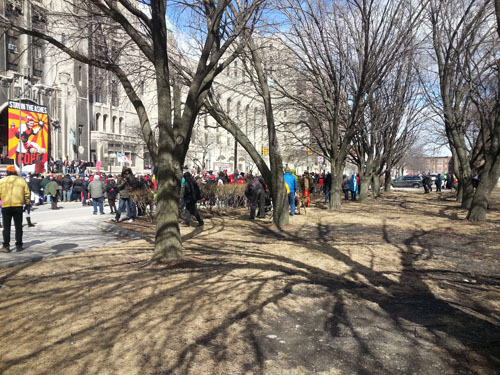 Whether the march is what they say it is or not, Detroit needs fun, and it’s hard to argue against such earnest attempts at it. But must fun come with a certain amnesia? Today the ground and bushes on Canfield and on Cass are brightened by dyed feathers and snippets of ribbon. I imagine a lot of the unfamiliar faces I saw on Sunday back in their elsewhere, recollecting a boozy memory of the weekend gone by. 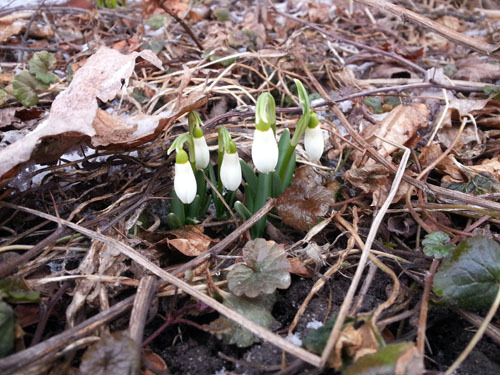 The wind scrubs clean the shrubs bit by bit, Detroiters lose their toothbrushes, and flowers come up soft and unsoiled.